"Death is un-American," an "affront to the American Dream," wrote historian Arnold Toynbee in 1969. It was a time of social movements, and big change: peace and civil rights, environmentalism and women's liberation. But a quieter revolution was underway too - one led by a few middle-aged women who wanted to change our way of death. 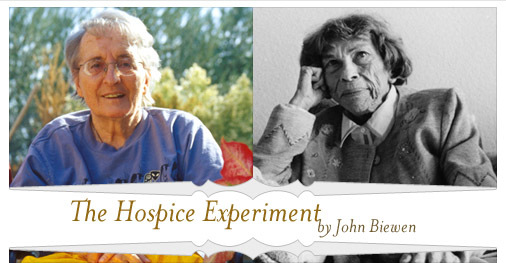 They were the founders of the hospice movement. Their movement did not involve marches, and until now, their story has mostly gone untold. This year, about 2.5 million Americans will die. About 900,000 of them, or three in ten, will get hospice care in their last weeks or months. Hospice is specialized care for terminally ill patients with less than six months to live. Its workers and volunteers often develop close personal relationships with their patients, exploring emotional, psychological and spiritual questions as well as medical ones. In this story, we follow one hospice patient through the last two months of her life. Listen to the hour-long documentary or read the transcript. A Reporters Notebook John Biewen writes about witnessing and recording the dying process. Do you have an experience with hospice? Tell us, or read the experiences of others. Documentary reporting on public radio needs your support. Help to maintain it by contributing to American RadioWorks. Additional support for this program came from the J.L. Foundation. American Public Media CDs, 45 East 7th Street, Saint Paul, Minnesota 55101.